The Tollemache family enjoy sharing their passion for the beautiful gardens, opening them to visitors throughout the summer. Helmingham Hall boasts a relaxed atmosphere for visitors to enjoy the serenity and tranquillity of the gardens as you lose yourself in the plethora of colour, scents and history on offer. We recommend that you allow two hours to visit the gardens; however most people stay much longer taking the opportunity to enjoy a delicious lunch or a cream tea in The Coach House, or to visit the gift shops, produce and plant stalls. Please note that opening times on event days may vary. We accept payment by cards, although please note that we have no card payment facility on the entrance gate on event days. We have car parking facilities and free coach parking. There is full wheelchair access to all of the gardens. 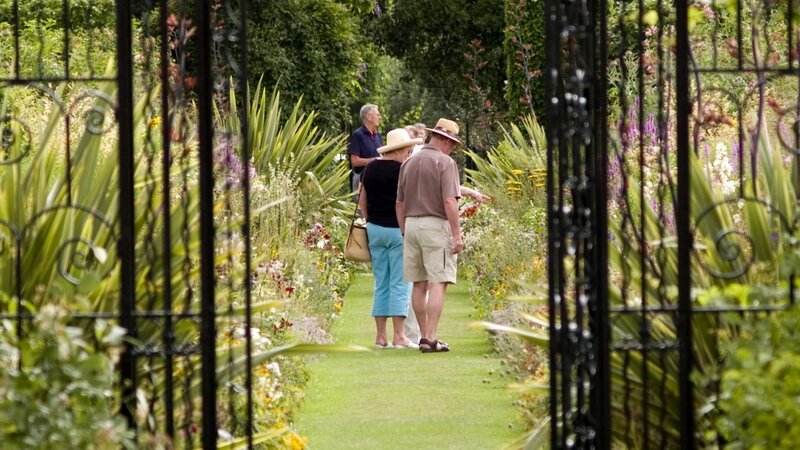 A wide variety of groups and clubs, as well as tour operators, visit Helmingham Hall Gardens from all over the world every year. Download the group booking form now. The Stable Shop sells a number of local arts and crafts, as well as a range of local produce, garden accessories and gifts. The Stable Shop also sells home-grown seasonal produce directly from Helmingham Kitchen Gardens and plants from our nursery. Although not registered as organic, our produce is grown the traditional way with little or no chemicals.